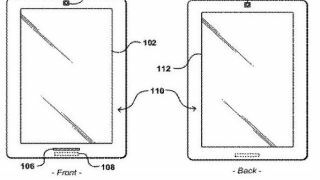 Amazon has filed a patent for a unique dual-sided tablet featuring two screens. Why would you want a screen on each side? Interestingly, the second screen should improve the tablet's battery life. Each screen in the proposed patent would serve a different purpose. One screen, an e-ink display, would serve static content like text-heavy documents and e-books. The opposite screen would be a full color LCD or OLED display, best used for videos, games, magazines, and web browsing. By including both screens on the same tablet, it could switch between the two in order to conserve energy running apps and documents when only the e-ink display is needed. The patent also suggests deeper integration of the dual-screen format. In one example, both screens are touch capable, allowing users to drag and move content between the two displays. It also details a method to use the tablet's built-in cameras to detect which side is facing the user so that it will automatically switch which screen is being used. While Amazon is looking far into the future with its patents, a recently leaked image gives a closer look at what is allegedly the Kindle Fire 2. We may get confirmation on that image soon too, with conjecture pointing to an Amazon unveil of a a 7- and 10- inch tablet at a Sept. 6 press conference outside Los Angeles. TechRadar is attending the Sept. 6 event, so we'll have all the latest Amazon and Kindle news as soon as it's available.